Satisfying the requirements of minimum qualification specified in A above. NET/SLET/UGC/CSIR(JRF) or equivalent national level examination qualified candidates. You may also obtain the application form from JIIT, Noida, as per the above addresses by sending a draft of Rs. 1,000/- or purchasing on counter with cash. Tests / Questions shall be different for each discipline of the program. The syllabi for each program have been loaded on the web site. F. Personal Interview shall be conducted only for candidates eligible as per B(ii) above. 12 of 6 marks each. Note:- 2 marks for precise and accurate answers will be awarded. 65 Questions of 1 marks each only 50 questions o be attempted. (50%) 50 MCQs of 1 marks each in area of Research Methodology in Social Sciences Qualitative and Quantitative Techniques. (50%) 5 Descriptive Questions of 10 marks each (Only one area to be attempted out of 5 listed i.e. Sociology, English Language & Literature, Economics, Psychology, Finance, Marketing and HR). J. Institutional Fee: The fee shall be Rs. 25,000/- per semester. 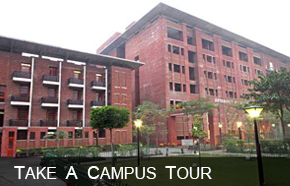 K. Limited shared hostel accommodation is available for Ph.D. Scholars at an additional hostel fee of Rs. 55,000/- per semester which includes boarding and lodging. L Research Fellowship: Financial Support may be provided to full time Ph.D. students in the form of Research Fellowship, subject to availability.